On Saturday the 4th, open tryouts for DSU’s first e-sports team were held in the spectrum lounge. 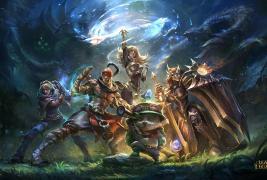 This team of electronic athletes was formed under the supervision of the gaming club but is run by a separate set of officers all devoted to League of Legends. Potential contenders were of the most varied variety that could be expected from DSU. There were just as many out-of-state-students as in-state students, and a very wide variety of first to fourth year students who came to tryout in their free time. The official turnout was 40 people and every single one of them played at least two games of the three that were needed to grade the first tryout. The personal skill level of the team members who were selected also varied greatly, but overall there is so much potential talent on campus that DSU will have an extremely competitive team for upcoming tournaments. The cutoff for most of the members was hard argued and resulted in more than two hours of debate for the fifteen available call back slots. The second round of tryouts were held on Thursday, October 9th with 20 players going head to head in custom games. These games were very competitive in nature as the winners would knock out the losers from any chance of being on the collegiate team. The games and player discussion ran on throughout the night and finally two teams were decided upon. Jesse Plaetz – Mid lane. Top lane for team two will be the bottom finishers from team one. The first game will be Saturday, October 18th at 2pm. The location, as of now, is undetermined, but in the future there will be a place for spectators to watch the team compete in tournament play.